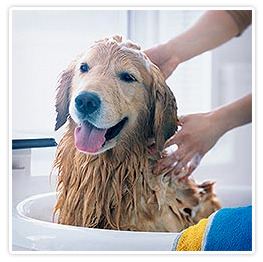 CVH offers a wide variety of grooming options for you to choose from. A comprehensive bath for your pet includes a wash with our Hydrosurge Bathing System, dry, comb out, pedicure and general ear cleaning. Medicated baths are also provided per the doctor's recommendation. Flea and tick dips are also available if necessary. All baths and dips are by appointment only.